For the first time since 2008, the high schools in Illinois’s second-largest school district combined forces to make a mega-marching band for a Thanksgiving parade in Chicago, the Elgin Courier-News reports. 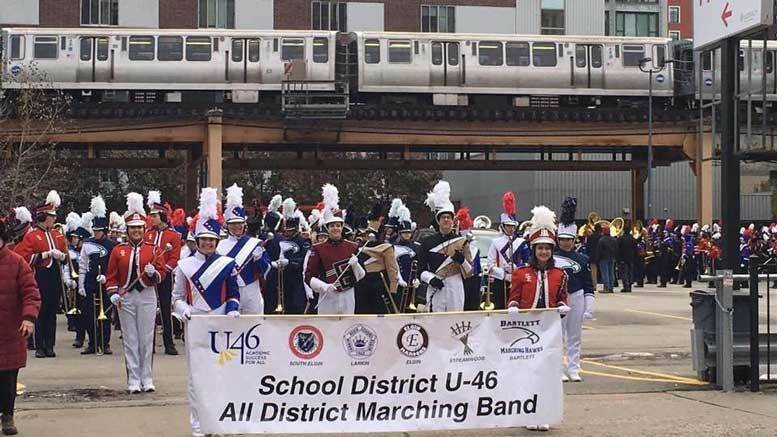 The 566-member marching band, designated as the School District U-46 Unified Marching Band, brought student-musicians and marchers from the district’s five high schools—Bartlett, Elgin, Larkin, South Elgin, and Streamwood—to the McDonald’s Thanksgiving Day Parade in 22 buses. There were 101 clarinetists, 79 flutists, 83 trumpeters, and almost 100 percussionists. The unified band participated in the 2008 parade, but that group didn’t have more than 500 members. This group may have been the largest marching band ever to participate in the parade, but there’s really no way to know that for certain. None of the five band directors were part of the 2008 unified band, Ms Abney-Giraldo said, and it wasn’t known when the group would be brought together again. “We’ve been getting that question a lot,” she said. School District U-46, based in Elgin, serves more than 39,000 students and is the largest district in Illinois outside Chicago. In addition to the five high schools, the district also includes eight middle schools, 39 regular elementary schools that include eight pre-K programs, and other education centers. The district’s CEO, Tony Sanders, has been a persistent lobbyist both in Washington and Springfield, working toward more equitable school funding for Illinois children and schools. His participation in the White House’s Rethinking School Discipline conference in 2015 represented Illinois well—suspension rates in U-46 schools are lower in recent years, thanks to staff working with and supporting students, despite an 11.8 percent chronic truancy statistic. That number counts students who miss more than 5 percent of the school days without a valid excuse. For comparison purposes, Naperville Community Unit School District 203 (~16,600 students) reports a chronic truancy rate of 0.6 percent, and Chicago Public Schools (~383,000) reports a chronic truancy rate of 34.3 percent. A little more than 60 percent of the students in District U-46’s schools are designated as low-income students.